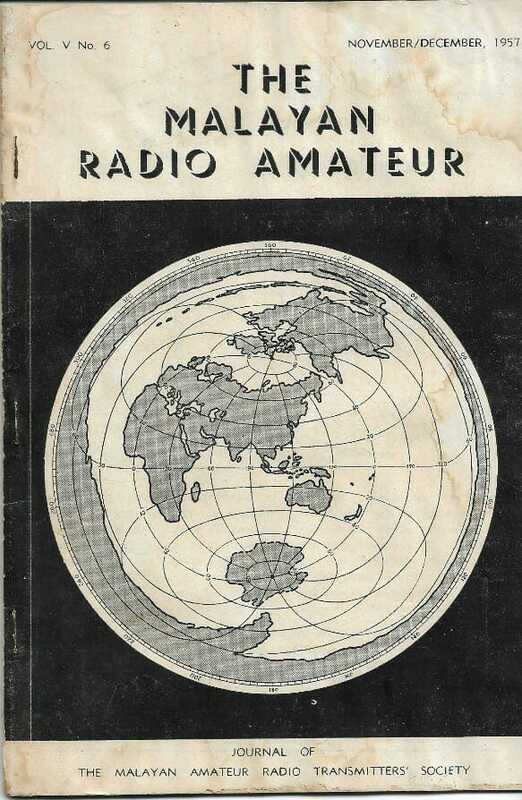 Amateur radio, the scientific hobby that brings together enthusiasts in many parts of the world, irrespective of race, creed, or social standing, was first introduced into Malaya in the late 1920s. Amongst the early pioneers was R.E. Earle, VS1AB, who was active during 1928 to 1930. At that time, overseas transmissions were scarce and irregular. Also the late G.M. Salt, VS2AF, who commenced in 1930 from Glenmarie Estate, Batu Tiga, Selangor, and the late T.G. Laver, VS2AC, from Masai, Johor. The late A.N. Randall, VS3AB, operated from Johor Bahru. Reg. Hollis-Bee of the Public Works Department operated as VS2AG from Kuala Kangsar, Perak. During 1932, VS2AF and VS2AB operated successfully on 56 MHz over a distance of 10 miles. E.C. Yates, VS1AD, was operating on the 20 and 40 meter bands in between 1920 and 1930 on Phone and CW (continuous wave). During 1930, he obtained permission from the Posts and Telegraphs to opera a broadcast service on 42 meters. Programs were broadcasted on Monday, Wednesday, and Friday evenings from 6 pm to 8 pm, and on Sunday mornings from 11 am to 1:30 pm. In 1932, he relayed the dance music from the Adelphi Roof Garden on the occasion of the Annual Ball of the Singapore Amateur Radio Society. These transmissions were well received throughout Malaya. In November 1933, the Posts and Telegraphs granted a license under the call of 2HI in the 49 meter band, and the broadcasts were concluded on the 42 meter band. Jim Macintosh, VS2AA, came on the air during January 1934. Using only 5 watts, he established two-way working with five out of the six continents on 40 meters CW during his first month. The missing continent was South America, which is still a difficult continent to contact. Before the year was out, never using more than 20 watts, he had his WAC (Worked All Continents), and WBE (Worked all British Empire). The first WAC for Malaya was made by A.N. Randall, VS3AB. In the early days, communication was restricted to CW. But today, Malaysian amateurs, perhaps better known as hams, can be heard in most evenings on 15 and 20 meter bands conversing on phone with other hams in Australia, north America, Europe, Africa, and occasionally with the extreme ends of the earth, eg. Virgin Islands. For local contacts between amateurs in Malaysia, the 40 meter band is the most popular. And there has been a regular Sunday morning phone net for several years. It usually ets going at around 9:30 am, and sometimes lasts into the early afternoon. Since the World War II, groups keen amateurs have formed societies to promote their interests, and lend a helping hand to the beginners. The Perak Radio Society and Selangor Radio Society were formed in 1947, whilst the Malayan Amateur Radio Transmitters’ Society was registered in 1952. The latter’s chief function being to act as a central bureau for both inward and outward QSL cards (confirmation of contact) between the Malayan stations and amateurs situated overseas. The Selangor Radio Society was the result of the untiring efforts of the first president, Jim Macintosh, VS2AA, Law Joo Ghin, VS2AO, N.L. Narayan, VS2CN, N.A.K. Nair, Au Yong Siew Thong, and Rodgers Rowe. The Singapore Amateur Radio Transmitting Society was founded in 1949. Amongst these who attended the inaugural meeting were Ted Yates, VS1AD, Reg Hollis-Bee, VS1AG, Mike de Cruz, VS1DU, Charles Salton, VS1DV, Ken de Souza, VS1CZ, and John Osborne, VS1BO. The tendency had been for the Malaysian Amateur Radio Transmitters’ Society (MARTS) founded in 1952, to expand at the expense of the local societies with the result that the smaller societies have been wounded up. The service provided to members will then be always up to the standard envisaged by its founders. After the winding up of the numerous amateur radio societies in Malaya at that time, the hams started to consolidate and looked toward a central body to serve and looked after their interests. The founding of MARTS was the work of the following hams, who remained in office for many years after is formation: Eu Khuan Kew, VS2BS, J.E. Hemphil, VS2CR, S.A. Faulkner, VS2DB, and C.E. Salton, VS2DV. Call sign prefixes used then were VS1 for Singapore, VS2 for Malaya Federated States, VS3 for Malaya Non-Federated States, VS4 for Sarawak, VS5 for Brunei, and ZC5 for British North Borneo. Full membership was opened to radio amateurs in the Federation of Malaya, Singapore, British North Borneo, Brunei, Sarawak, and Christmas Island. Total membership was less than 100 members, and the society’s registered address was PO Box 600 in Penang. Radio communication was confined only to the HF bands using the AM and CW modes only. After the Emergency period, the VHF band was opened to the hams. And from then on the introduction of repeaters came about, after VHF FM amateur radio communication gaining popularity among the members. In 1975, The first VHF repeater, 9M2RUK, was installed by MARTS on Gunung Ulu Kali in Genting Highlands for covering the Klang Valley, and its surroundings. Subsequently it was followed by the setting up of the 9M2RBB repeater on Penang Hill in 1984, Gunung Ledang repeater 9M2RGL, Kuala Lumpur’s 9M2RKK and 9M2RKL also followed suit. In 1989, the Gunung Pulai repeater 9M2RGP was put up, and one year later the Kangar repeater 9M2RMK was installed.